Mother Mago, the daughter of the Sky God, had made her home on Cheongwangbong. 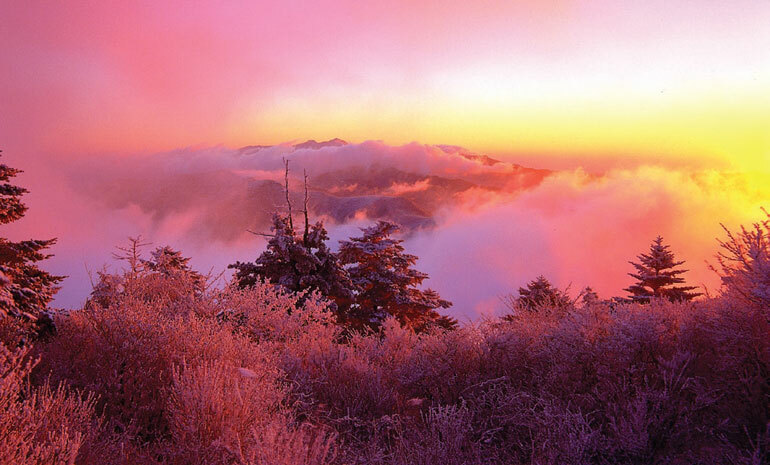 One day she met a sage called Banya, who was studying Buddhist doctrines among the peaks of Jirisan. They fell in love and got married, living happily on Cheonwangbong for many years and bringing up eight daughters. After a while Banya left his family in search of deeper enlightenment. He went into an extended retreat on Jirisan’s second highest peak (now known as Banyabong), and still had not returned when Mother Mago’s hair had all turned grey. While he was seeking enlightenment, Mother Mago made clothes for him out of tree bark to comfort herself in her loneliness.2 As her daughters came of age, Mother Mago sent each of them to a different province of Korea, and waited alone for her husband to return home. Finally, fed up with waiting, she ends up tearing to shreds the clothes she had made for her husband and passes away soon after, becoming a stone statue. It is said that the shredded clothes flew on the breeze to Banyabong where they became the wind orchids that grow on the peak today. 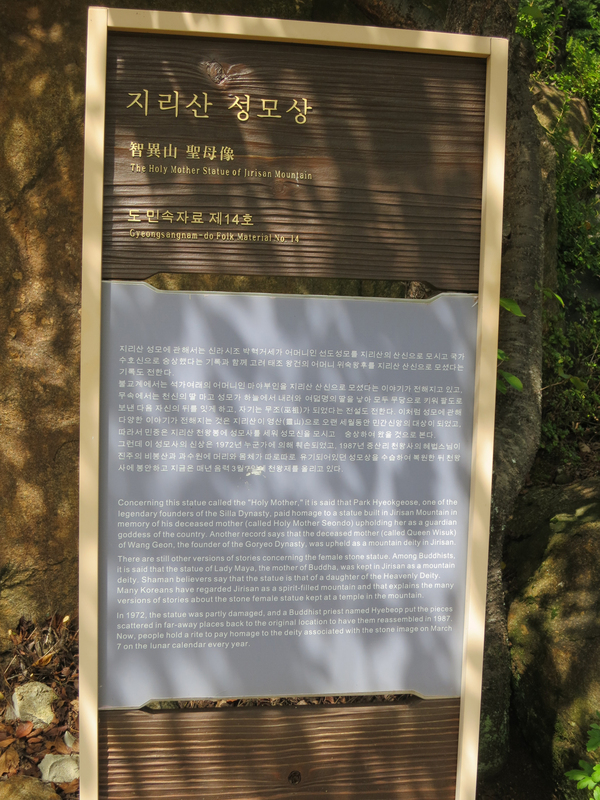 The eight daughters of Mother Mago became the ancestors of the shamans of Korea’s eight provinces. It is also said that the reason Banyabong is often shrouded by clouds and fog is that the heavens are providing a modesty curtain for Banya and Mago to meet, even after their deaths, because they could not spend time together when they were alive. The ascending atmospheric currents from the valley turns into a sea of clouds surrounding Banyabong Peak, like an ancient ink-and-wash painting. Mago’s stone statue had stood near Cheongwangbong peak for many centuries, enjoying the devotions of travellers and monks who passed by. Then, in 1972, a bunch of fundamentalists,3 unmoved by the legends and offended by the existence of this idol, hurled it into a ravine, badly damaging it. 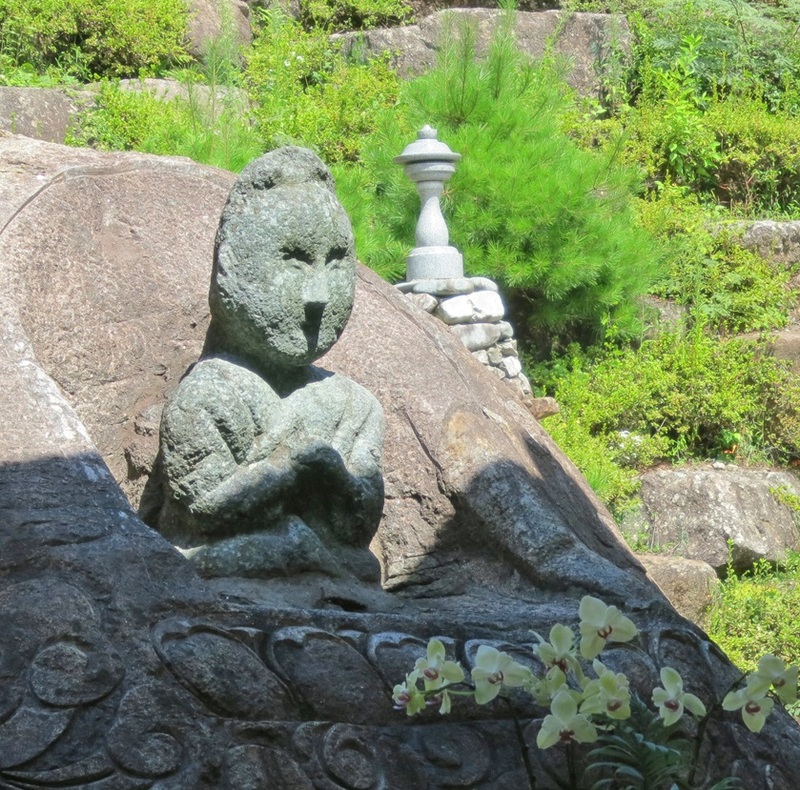 Fifteen years later a Buddhist priest named Hyebeop repaired it, and the statue now rests at the foot of Jirisan just outside Jungsan-ri. Every year on 7 March in the lunar calendar, people hold a rite to pay homage to the deity associated with the stone image. And perhaps each person at the ceremony is honouring her under a different name. We drive up a narrow lane and leave the car in the front yard of what felt like a down-at-heel temple.4 We walk up a slope (thighs complaining bitterly now) to what looks like a giant temporary greenhouse. We peer in through a door situated one third along one of the side of the construction. Inside, there is the sacred aura of a church. To the left is the altar area, and to the right a large space, the ground covered with temporary wooden flooring, where the congregation would be. Sitting on her own, cross-legged in the centre of the floor, is a pregnant woman quietly meditating, her eyes closed. She is facing the altar area, silently asking for a blessing on the unborn child. In the sanctuary, accompanied with freshly cut flowers, is a small stone statue, roughly carved in granite: Mother Mago. From the folk tales I had been somehow expecting an image of a rotund, laughing earth-mother, maybe something like a cross between the Michelin man and the jolly green giant – only female. Instead, the statue’s features are simple, austere, stylised, her eyes closed as if she herself is in prayer, like an earthy creation of the artist and sculptor Amedeo Modigliani. In the makeshift shrine there was a feeling of peace and rest. The statue is shaded, but behind her the sun is shining brightly on the rich vegetation of the hillside. 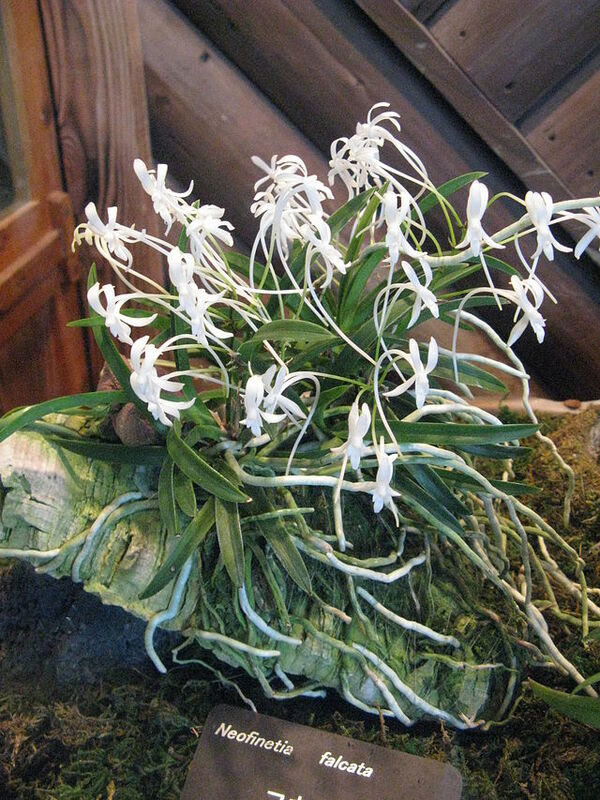 In front of her, orchids have been placed as an offering, maybe by the lady meditating. We leave, each one of us sharing a strange feeling that we have participated in the prayer of the mother-to-be, and even that we have received some of Mago’s blessing on her. The time is only 11:30, but this is Korea, and food never seems to be far away. We head off for lunch at the same place where we had gone after our abortive hike up towards Cheonwangbong last year. Creamy dongdonju, pyogo mushroom pancake and more. As usual, the dongdongju gives us all a feeling of well-being and brings warmth to the cheeks. We take Mr Yoon home to his family, though we suspect that after a quick change of clothes he’ll be heading back to the office at the Expo where his media relations team and operations staff will be waiting for him. Meanwhile Kyung-sook and I have some chores in town: a bit of food shopping for our accommodation, and seeing if I can top up my SIM card, which ran out of credit on the way down the mountain. Facing complete failure on the latter point, we head back to our accommodation where we rest. Encouraged that eating fatty belly of pork can allegedly be a health-giving experience, I eat an indecent amount of the plump meat, forgetting, as I often do, that the carbohydrates will be coming later. I fail to make much of an inroad into the red bean rice which follows. As I try to force it down, I realise that I have been in Sancheong for three days and not really seen anything of the Expo apart from that brief stroll on the Friday morning – which hadn’t involved seeing any of the main exhibits – and a quick guided tour of part of one of the pavilions on the way to dinner that same afternoon. That experience was not going to give me much material for articles when I got home, apart from a sketch of a few ceremonies in honour of a mountain spirit and two dead doctors. My duties as goodwill ambassador, though undocumented, surely involve more than turning up and having a good time there once a year: I need to write about what they do and to promote the attractions of the county, and this involves some hard if pleasurable graft. It also means I learn a bit more each time I visit. I am now due to be in Jeollanmam-do for the next couple of days, leaving at most a day to get around the rest of the Expo when I return, before I head back to Seoul. And some of that time will be spent at the Institute going through their materials. I therefore need to do some careful planning of the priority areas to visit. Back at the chalet, over more Blue Label, we discuss the plans for the following morning. There is a whole site dedicated to the study of the Mago legend: magoism.net. See in particular this post. The statue can be found on Google Maps here. Information provided on a notice board by the current location of the statue. The statue, known officially as “The goddess of Jirisan (지리산 성모상)” is Gyeongsangnam-do folk material No 14.